This dress if from Shabby Apple and I love it. It is very Anthro-like. Would it be too much if I got it since I have the Four Petal Cardi that is so similar? Color block dress with solid green & stripes on the top. More teal than green, but similar and cheap by Forever21. 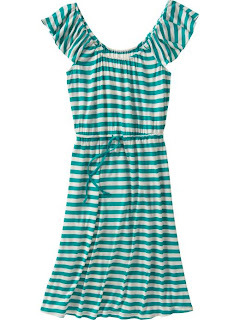 Another more teal striped dress, but cute! What do you think? You ok with green taking over red for the new candy striper outfit? I love it!